I wanted to share some more Photography Tips to help people take pictures of their miniatures. 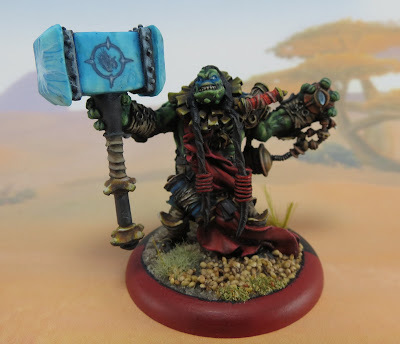 Now, I've talked about Lighting Your Hobby Area before and if you haven't read it, then you should. 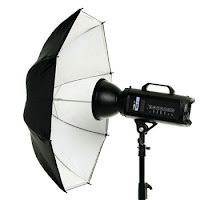 It'll give you a lot of useful information about different types of lights and how best to use them. You can do what you want while painting. Sometimes stronger light is better. This article will discuss lighting while taking photos. I'm not above criticizing myself, so I have some examples of poor photos I've taken and good ones, that I'll dissect for you. I'm going to start by using the following photo as an example... I won't analyse it yet, I'm just going to put it here as an example of good lighting. First, lets look at a couple bad examples and what to look out for. This is the number one way to be able to tell that your light is either too strong or too close. Matte (non-shiny) surfaces shouldn't reflect much light. If your colours are disappearing to white light, it's too strong. This can happen if strong light hits at just the right angle. This is a larger example of how missing shadows look unnatural. When they're missing from beneath large areas - places that should obviously have shadow. Once again, the shadows are extremely visible on the background. You can see again how the light can wash out your paint a little to a lot. Again, it's noticeable when it hits a large surface at the right angle, or on edges / curved areas. In the shinier area, (top example) it washes out a smaller area, but stronger. The detail of the hand nearly disappears completely because you can't see any shadows between the fingers or under the knuckles. The "rock" the Wraithlord is standing on is missing the shadows beneath it, removing depth. 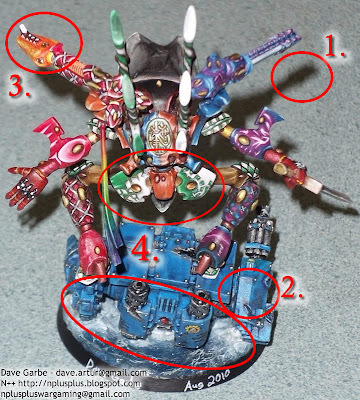 Now that you've had a chance to see some examples of poor lighting, I'll break down the photo of Madrak for you. Using diffused (indirect) light creates a softer appearance and lets you know you're on the right track. 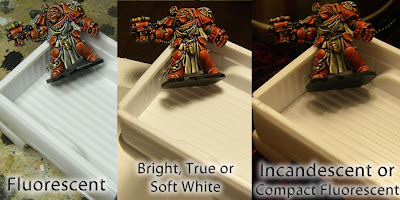 Edges and surfaces don't have any "white" from the light. 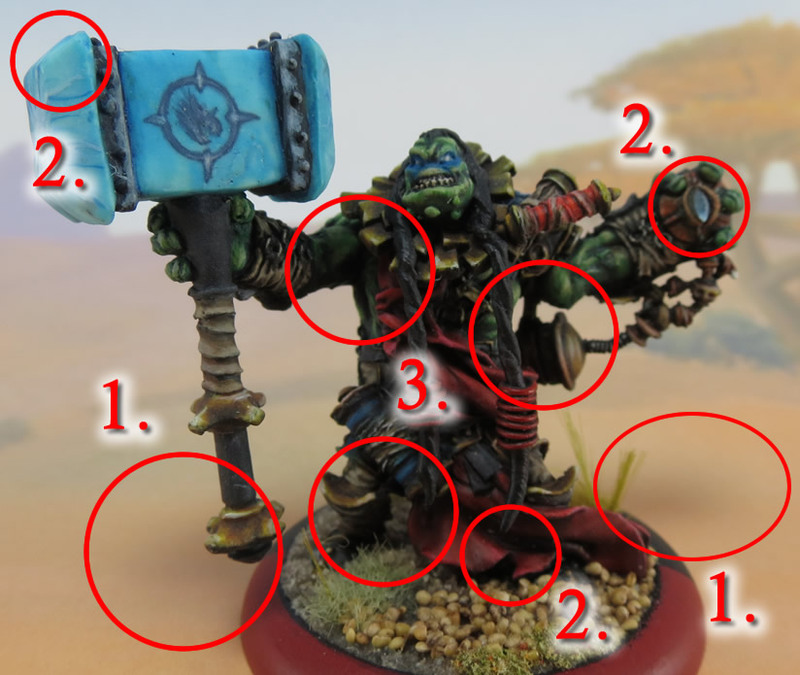 They may appear brighter, especially with painted highlighting, but even the glossy gem (upper right) doesn't wash out. There are dark areas where they naturally should be - under the arms, between the legs, under the head of the hammer, etc. Shadows can be seen all over, without removing detail except where it should be harder to see. First things first... you've followed the above links on lighting (Right?) and have picked up some bulbs that emit actual white light, not yellow, without looking white-blue. Next, the trick with good lighting is to make sure it's not too bright when it hits your model. You want to see natural shadows in the model (not the background) and the light shouldn't wash out your colours. You can achieve this by using a light that's not too strong, moving it further away from your model or diffusing it somehow. 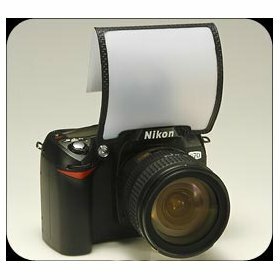 Shining a really bright light through something white (like thin cloth or thin paper) to emit a soft glow rather than sharp direct light. 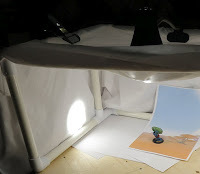 Shining a really bright light away from the model against a white surface (like thick cloth or thick paper) so that you're lighting the model with reflected light.